?If I am off work, how often will I receive my total TTD (temporary disability check) and what do I do if I don’t receive it on time? ?How do I schedule/reschedule a workers compensation hearing? When you think of workers' comp injuries, it is likely that you think about slipping and falling or possibly getting hurt by a machine. What many people do not think about is the danger of the machine that sits in front of them on a daily basis as they work in the office. Yes, it is true that the computer can cause serious injuries while you are at work. Some of the injuries are even bad enough to cause people to miss many days or weeks of work. Sitting all day long is hard on your body, believe it or not. This is especially true if you do not sit properly. If you continually slouch at your workstation, you could be restricting the blood flow throughout your body, taxing your muscles and causing chronic muscle aches as well as headaches. When you sit at a computer for many hours per day, you are at risk for overuse injuries. These can occur to your elbows, wrists and hands. They are typically due to repetitive use of the keyboard and mouse, and can develop into carpal tunnel syndrome. This is an especially significant danger for those who do not take breaks, eat through their lunch and stay hunched over their computer all day long. Just like you can prevent serious injury from occurring on job sites by following certain safety precautions, you can prevent them while working in an office. 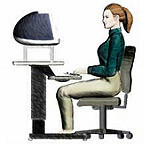 Try to set up your workstation to be ergonomically correct. This means making sure that your monitor is at an appropriate level to ensure that you do not have to hunch over or look up to see it. The same is true for your mouse and keyboard - they should be easy to reach and not cause strain on the muscles. Your feet should be flat on the floor and your arms should be at a comfortable position all day. In addition to setting up an ergonomic workstation, it is important to take frequent breaks. This means not working through lunch and getting up from your chair every couple of hours. Even if you only look away from the computer or walk away for a minute or two, it is enough to give your muscles a break. If you are able, try to stretch your back, arms and legs to ensure that they are fully capable of handling the stress of working on the computer all day, allowing you to avoid workers' compensation injuries in Iowa. If you or someone you know has been injured at work, Walker, Billingsley & Bair is here to help answer your questions. Iowa Workers' Compensation Attorney Corey J. L. Walker practices primarily in work injury law. He offers a book about Iowa work injuries at no cost, risk or obligation. The book is called “Iowa Workers’ Compensation- An Insider’s Guide to Work Injuries” which includes 7 Deadly Mistakes to Avoid if You are Hurt at Work. To order your copy go to http://www.IowaWorkInjury.com or Call Now 1-800-707-2552 (ext. 811) (24-Hour Recorded Message). Iowans hurt at work are beginning to realize that the insurance company is not there to help them and that they should learn about Iowa's workers' compensation laws. For immediate assistance, contact us online or call 515-440-2852 and ask for Corey.